Ale brewed with cherry juice natural flavors added. Handcrafted. Brewed at Melbourn Bros. ancient brewery in Stamford, Lincolnshire and blended and bottled at Samuel Smith's Brewery, Tadcaster, North Yorkshire. USDA organic. Handcrafted at Melbourn Bros tiny brewery set in a time warp in Stamford using the old manually operated brewing equipment. Finest organically grown barley and wheat are used to create a complex ale which, having undergone primary and secondary fermentation with different yeasts and extended maturation, is taken to Samuel Smith's small, independent British brewery at Tadcaster. There it is blended with pure organic cherry fruit juice and a previously cellared organic brew - creating an unparalleled fruit ale. 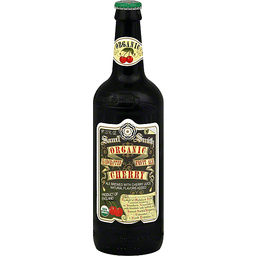 The smooth distinctive character of the matured ale serves as the perfect counterpoint to the pure organic fruit juice. Soil association organic standard. Organic barley & wheat are milled by two belt driven rollers powered by the old Melbourn's steam engine. Certified organic by Soil. Assn. Certification Ltd. Product of England.